This trip will combine two different medical teams in India and Nepal. International Medical Relief will bring much needed aid to the world’s second most populous country, India. The team will care for those with the greatest need for medical attention. 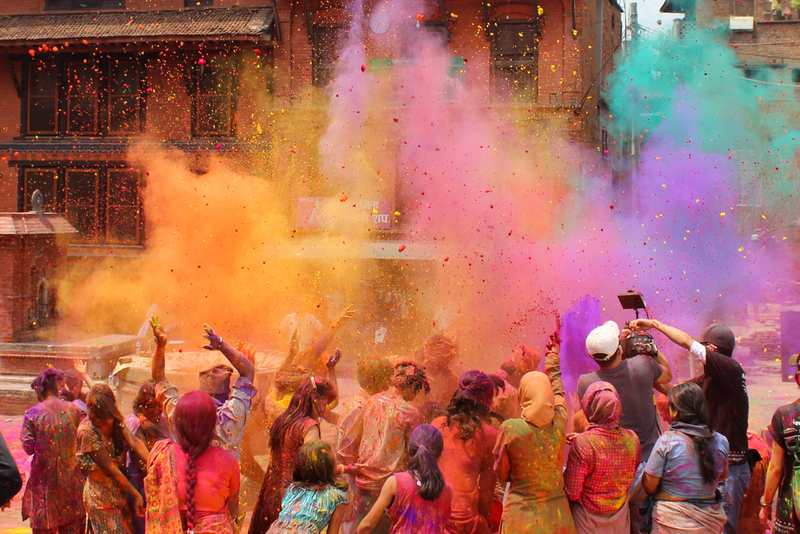 Engage this culture first hand as you provide greatly needed medical care to the densely inhabited communities, while also having the opportunity to be a part of India's famous Holi Festival! After attending the festival, you and the team will fly together to Kathmandu, Nepal! Kathmandu is located in a valley surrounded by the Himalayas and has a population of almost 1 million people. Nepal is a beautiful and exotic country with great need to meet its most recent challenge, the April 2015 earthquake. The nation is highly religious, with more than 80% of the population practicing Hinduism and many people having deep belief in both Hinduism and Buddhism. In addition to being home to eight of the top ten mountains in the world, Nepal also has some of the most beautiful religious sites in the world. Services are extremely limited for anyone outside of the capital of Kathmandu, especially in the areas where your team will be working. According to the World Health Organization, India is recording very high infant mortality and a high death rate due to malaria from improper diagnosis, treatment and care. It is imperative for IMR to continue to help the people in India and overcome these health conditions. In Nepal, the team will be working in small communities far outside of Kathmandu that were hit hard during the April 2015 earthquake. Your patients will include the residents of small, remote villages who are in desperate need of medical and dental care and health education. You will be able to provide your patients with the immediate care they need and the education to help them help themselves long after you leave. IMR’s medical and dental teams will provide immediate care medicines, laboratory testing, wound care, and more these villages and you will get to know their community as you will be staying in a beautiful guesthouse for the week near the villages you are working in. You will be able to work side-by-side with the IMR's many local medical partners on this trip, providing education on breast cancer prevention, continuing to provide reading glasses and eye examinations, and giving care and comfort to hundreds of patients in need. In India, you will find the lodging to be more than comfortable and a great respite after working hard all day. The food will be wonderful and filled with local flavors and textures. Hyderabad is known for Hyderabadi Biryani, Keema Samosa, amazing soups, and amazing Kkatti Dal, where tamarind gives the lentils zest! You'll travel by coach bus and although the traffic is legendary, we'll try to avoid the worst spots or at least keep you laughing on the bus...our ground team knows the routes to get us where we need to go! You will fly as a team to Nepal for the second half of your trip and stay in comfortable and simple accommodations. The accommodations are safe, clean, and the best of what this community has to offer. Local foods will be served, including the community staple, dal bhat, consisting of rice and lentils with a variety of spices. Tibetan delicacies will also be accessible to you during your trip! Don't miss the water buffalo momos and the many varieties of rice pudding! There are too many highlights on this trip to list but Holi is definitely center stage. You will participate fully in the ceremonies, sharing of the colors by spraying colorful powders and water on friends and strangers alike, with some special surprises from IMR! Your time in the villages will give you an opportunity to see the local culture and participate in their excitement while hosting your IMR team. A visit to a public hospital (with some volunteer time) and visiting an Ashram will be amazing cultural experiences during your time in India! Join the IMR team as we take part in some of these local celebrations! Many of our volunteers have extended their stays at the back end of the trip to visit amazing world heritage sites and natural wonders including the Ranthambore Tiger Reserve, where you can watch the majestic tigers in their natural habitat. A short flight to Delhi allows you to visit Agra and the Taj Mahal. In Old Delhi, you can see the Chandni Chowk market area and visit the Red Fort, Jama Masjid, and either Humayuns Tomb or the Lotus Temple. Pay 1,800 and complete your application to secure your place as a TEAM MEMBER! Pay 1,800 of the total cost by the Early Bird date AND upload/complete all of your required documents and forms receive $200 off the cost of your trip. To confirm your space on the team: Pay 1,800 of the total cost AND upload all of your required documents and forms! Unfortunately, eligibility for the $200 savings on this trip is no longer available after Dec 31st, 2018. Before Dec 31st, 2018: YES! IMR will arrange your international flight on a "group" ticket at your request! Pay 1,800 of the total cost AND upload all of your required documents and forms to be eligible to fly on the international group ticket. YES - We need your help to take IMR supply bags internationally to India & Nepal! Take 2 supply bags for IMR both ways to India & Nepal. IMR Subsidized Flight: In order to qualify for the IMR Subsidized Flight, you will need to reach 50% of theMinimum Donation Amount on or before Dec 31st, 2018. Early Bird Special: A discount of $200 is awarded to team members who raise / pay 50% of the Minimum Donation Amount on or before Dec 31st, 2018.